There was a short Q&A session, unfortunately I missed it, but the event was called the Community Cantina and it in fact was that. I was able to talk to some really great people. Talking with fellow gamers on what they loved about SWTOR. We exchanged our thoughts on storylines, being careful to not ruin spoilers for those who still haven’t seen all of them. I also got to see and talk with guilds I have interviewed for Community Checkpoint and some I hope to interview in the near future. All in all, it was about having fun and meeting others in the SWTOR community. I know that games are about mechanics, gameplay, content, balance, etc., but in an MMO if a game doesn’t have a community it will never last. Despite what the naysayers think there are many that like this game and enjoy playing it. SWTOR has one of the best communities I have been associated with and the Community Cantina in Chicago only reaffirmed that. I can’t wait to go the next one in this area! Most of you are aware of the latest event that Wednesday, August 14th. It is the Bounty Contract Event. The event introduces us to a new reputation system, the Bounty Brokers Association or BBA for short. The BBA are the ones, in-game, offering the contracts to players. To start the event you can see floating carbonite “blocks” holding a bounty on each faction’s fleet. By clicking on one of these carbonite bounties, starts the story beginning the event. You will then take an elevator to the new Cartel Bazaar located on each fleet. The brief story continues explaining about the need for people to help take down some contracts but, no disintegration (a small homage to lines spoken by Darth Vader to other bounty hunters). Players then select a contract by select a planet. The higher your level the more planets there are to choose from since all players level 15-55 can participate in this event. Each day a character is allowed to take one contract and later one Kingpin contract per day (Kingpin contracts require five regular contract certificates). 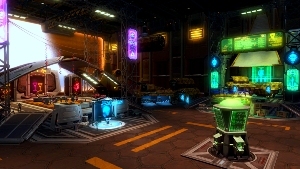 For each contract players can earn credits, BBA reputation trophies, and XP – unless the player is at level cap. What can you do with the BBA reputation? Funny you should ask that, because I’m going to tell you. 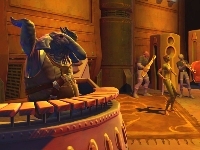 Just like the Gree Event, players start out as unknown to the BBA and through Legacy reputation points move their way up. As players level up in reputation points with the BBA, you can earn titles and new levels of “friendship” standings with the organization. The higher reputation standard a player has the more things that are unlocked for players to purchase. 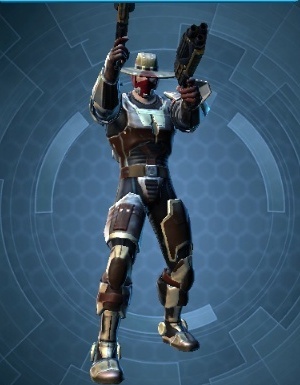 Now some of you are thinking, why would you to take time, just to earn the right to buy some more armor, weapons or even vanity armor…well for one, the armor looks really good, especially the “cowboy” style headgear. 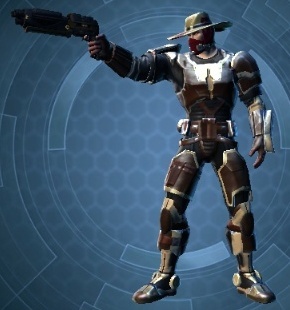 I also think that BioWare has added some really nice looking Bounty Hunter armor. 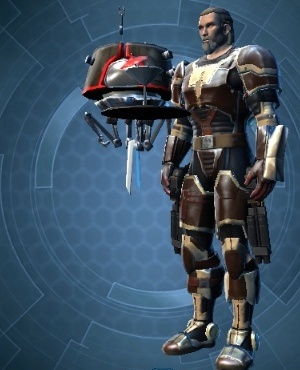 Oh, and there is a special customization for HK-51 you can purchase. I know some are upset at only getting one contract per day, per character, but I only used three of my characters in the event and made it to the first level of reputation in a couple hours of gameplay. The real downside is fighting or the part of the quests where players need to get info from Shady Character NPCs, but members of my guild can confirm that by grouping up you can share the NPCs and it counts for the group members. I would also remind you that if the instance of a planet is busy, don’t forget to open up your map and in the lower right corner of the map change your instance to a less populated one. Happy Hunting to you all! Okay all you PVPers, remember Update 2.4 was labeled the PVP Update? Well, Alex Modny, Assistant Designer for Combat and PVP team, has some actual details about Update 2.4 and it deals only with PVP. First off, the rumors about arenas are confirmed and in fact there will be three of them when Update 2.4 goes live. The arenas will be 4vs4 to the “death.” No objectives, no seeing who can reach a spot in the fastest time etc. just the last team of four players standing wins a battle and out of the two teams fighting, the one team to first get two battles wins the best of three match. There will be three arenas, one located on Corellia, another on Tatooine and the last one on an Orbital Station. Alex also goes into more details on how they will handle solo vs grouped queuing for Ranked Arenas. Speaking of Ranked PVP, there is another big change. 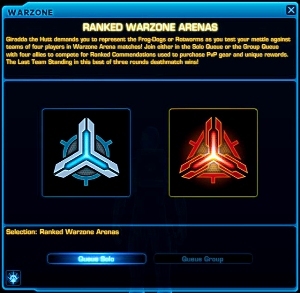 There will no longer be Ranked 8vs8 Warzones when Update 2.4 goes live. The reasoning, stated in the same article, is about the low numbers to support an active Ranked PVP system utilizing Warzones. That will mean Ranked PVP will be arena based only. I’m sure some are disappointed to see the Ranked Warzones go, but they did add in the article, that they are going away for now…leaving the chance they could come back if the Ranked PVPers increases to support them. The team is targeting putting the new Arenas on the Public Test Server n August 16th. Now remember this is only a target date and could be subject to change. Now I only highlighted a few of the main features of the article, but that is a lot of PVP goodness, right? However, just like on a good infomercial would say, “but, wait…there’s more!” Yes, that is right they gave us more in the article, a few little tidbits at the end of the write-up on more things to soon follow Update 2.4. First off, they will be removing F2P restriction for going into Warzones. This means more people playing PVP and so more people for you really good PVPers to kill. The next bit of info is another arena map, beside the three they announced this week. The final bit of news was not done with words, but a screenshot. 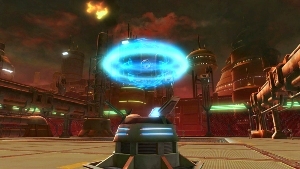 It is something many PVPers have been wanting for a long while now…a new Huttball map! I am only making a guess, but to me the image looks like it is located on Quesh. See for yourself in the image below and tell us what you think in the comments section. Don’t forget to read through Alex Modny’s entire article to read over every detail. I would also encourage you PVPers to read through the forum thread started by Courtney Woods and several entries by Alex Modny. That’s all for this week! See you all next week. If you have a particular link, story, video, or topic related to SWTOR we would love to hear about it! You can send those to us here at Corellian Run Radio and we can place it in a future article. Just email us the links and/or the details for the event at corellianrun@gmail.com, or you can also leave any link suggestions in the comments below, or in Corellian Run Radio’s Facebook group. See you all next week! @Miss Defied Thanks for your comments. 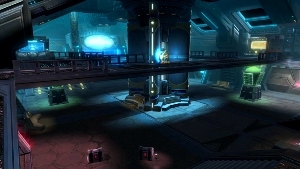 I can understand how the comment of mine might be taken, but I was looking at all the PVP, including new Huttball map. If you are a not a fan of arenas, I can see this looking as a bad update. However, they did mention that Ranked Warzones might come back at some point.